What is Alfalfa and history of Alfalfa? Alfalfa is a name everyone has heard, but few know much about it other than the fact that it's a plant. 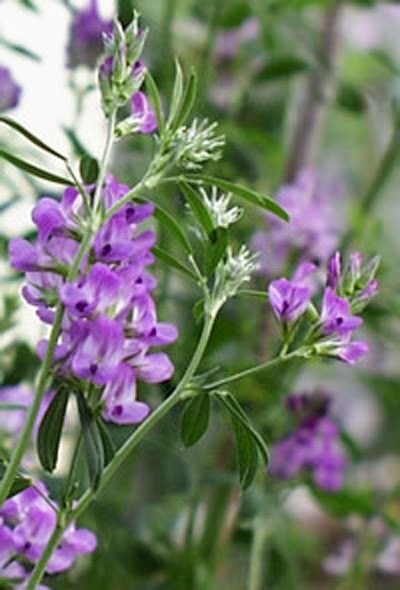 The alfalfa plant is primarily native to Asia, and is considered to be one of the first known herbs to mankind. It is a member of the Pea family Fabaceae and it is often used for feeding animals as it has the highest nutritional value of all the hay/forage crops. The word alfalfa is derived from Arabic, specifically the phrase al-fac-facah, which literally means "Father of all foods" because it is so rich in essential nutrients. Alfalfa is rich in vitamins, minerals and other nutrients that play a vital role in the strength and growth of our bones and in the maintenance of a healthy body. It contains protein and vitamin A, vitamin B1, vitamin B6, vitamin C, vitamin E, and vitamin K. It also contains calcium, potassium, carotene, iron, and zinc. It can be taken in the form of seeds, leaves or tablets. The noodle-like sprouts are salad and sandwich staples, while alfalfa leaves and flowers can be made into herbal tea and drunk up to three times a day. 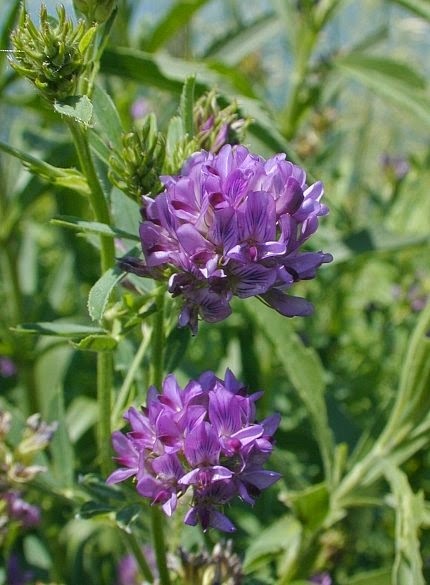 Traditionally, the herb was used to kick-start the appetite and ease indigestion, while alfalfa seeds were made into a paste for treating insect bites and boils. A 2008 study published in the Pakistan Journal of Pharmaceutical Sciences tested the effects of alfalfa on cardiovascular disorders. The study, which was conducted on animals, found dietary alfalfa increased levels of high-density lipoprotein (“good” cholesterol); a reduction in the build-up of fat in the arteries was also noted. 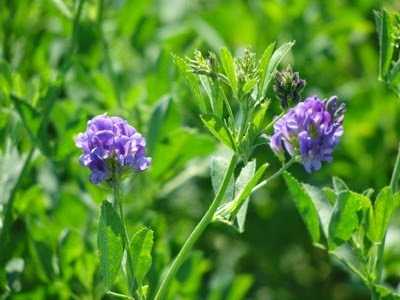 A clinical trial in Budapest tested the effect of alfalfa leaf extract on 20 diabetic patients. Alfalfa was dosed at 1g twice a day, over 16 weeks, with patients showing a 24-percent drop in blood cholesterol levels after eight weeks, which stabilised in the following months. It’s an area that requires further study, however. 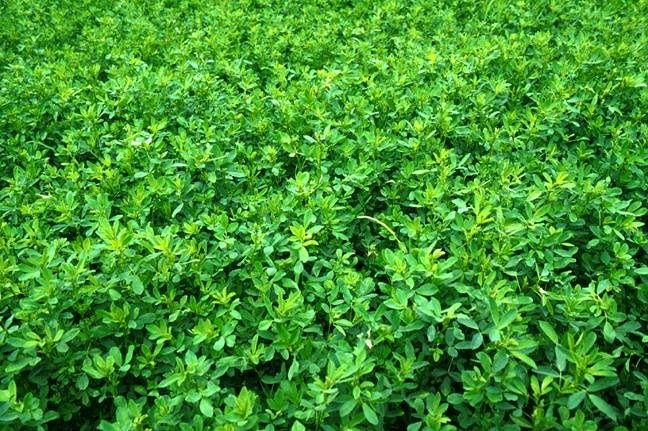 Alfalfa has been used by the Chinese since the sixth century to treat several health conditions. The alfalfa plant is naturally high in many essential vitamins, including A, D, E, K, and even the full family of B vitamins. Each individual vitamin has an abundance of health benefits in itself, making them crucial to overall human health. It is surprising for so many different types of vitamins to be present in just one plant, which makes the lure of consuming this plant all the more greater. Not only does the alfalfa plant contain a full spectrum of important vitamins, but it is also loaded with extremely important minerals such as biotin, calcium, folic acid, iron, magnesium, potassium, and many others. As if there needed to be another reason as to why it's so great, the alfalfa plant is also super high in protein, especially when dried. Alfalfa has a long history of health benefits. Some consider it a superfood! Alfalfa can increase the ability of blood to clot after an injury. Aspirin delays clotting, so taking alfalfa could interfere with the anticoagulant effects of aspirin. 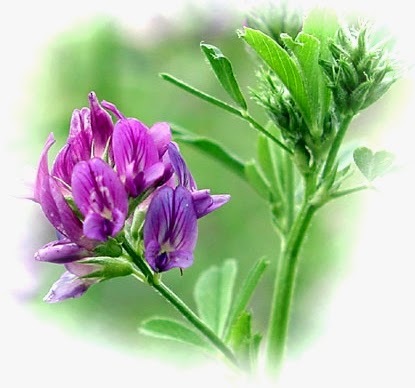 Alfalfa should not be used while aspirin or anti-clotting medication is being taken on a regular basis. In animal studies, alfalfa caused the muscles in the uterus to tighten. Potentially, this tightening could cause a miscarriage, so alfalfa products should not be taken by women who are pregnant. Vitamin A - for night vision and important for eye health. Builds resistance to infections, especially in the respiratory tract; promotes growth ands vitality; promotes healthy skin and is essential in pregnancy. Vitamin E - protects cells against damage from sun's radiation and air pollution; promotes heart, cardiovascular and muscle health and improved immune function; promotes muscle tone in the body; helps bring nutrients to cells and helps strengthen blood vessel walls, including capillary walls; helps proper focusing of the eyes. Vitamin U - promotes health of body to help overcome peptic ulcers. Vitamin B6 - helps food assimilation and protein and fat metabolism; promotes nerve and skin health; helps battle nausea symptoms. Vitamin K - essential for blood clotting; important in liver functions; may possibly contribute to vitality and longevity. Alfalfa can increase the ability of blood to clot after an injury. Aspirin delays clotting, so taking alfalfa could interfere with the anticoagulant effects of aspirin. Alfalfa should not be used while aspirin or any anti-clotting medication is being taken on a regular basis unless the doctor knows about your supplementation. Vitamin D - regulates the use of calcium and phosphorus in the body and is therefore necessary for the proper formation of strong and healthy teeth and bones. Calcium - builds and maintains bones and teeth; helps clot blood, aids in vitality and endurance; regulates heart rhythm, soothes nerves. Iron - required in manufacturing hemoglobin; helps carry oxygen in the blood. Manganese is a trace element that is thought to be involved with the body's use of carbohydrates from food. This helps alfalfa lower blood sugar levels. Because alfalfa may have a lowering effect on blood sugar, alfalfa may increase the effectiveness of medications used for the treatment of diabetes. Contact your doctor before beginning supplementation with alfalfa if you are being treated with medication for diabetes. Potassium - necessary for normal muscle tone, nerves, heart action and enzyme reactions; digests fats. Phosphorus - needed for normal bone and tooth structure. Interrelated with action of calcium and Vitamin D. Improves nourishment of nerve tissue. Chlorine (chloride) - an essential electrolyte which cleans and purifies the body; regulates fat, sugar and starch metabolism. Sodium - regulates fluid balance throughout body; neutralizes acids, prevents clotting of blood; activates spleen, bowels and stomach functions. Silicon Magnesium - helps body to deal with constipation; steadies the nerves; has protective effect on skin and body; stimulates brain function. Alfalfa's deep roots seek out minerals in the subsoil, which are inaccessible to other plants. 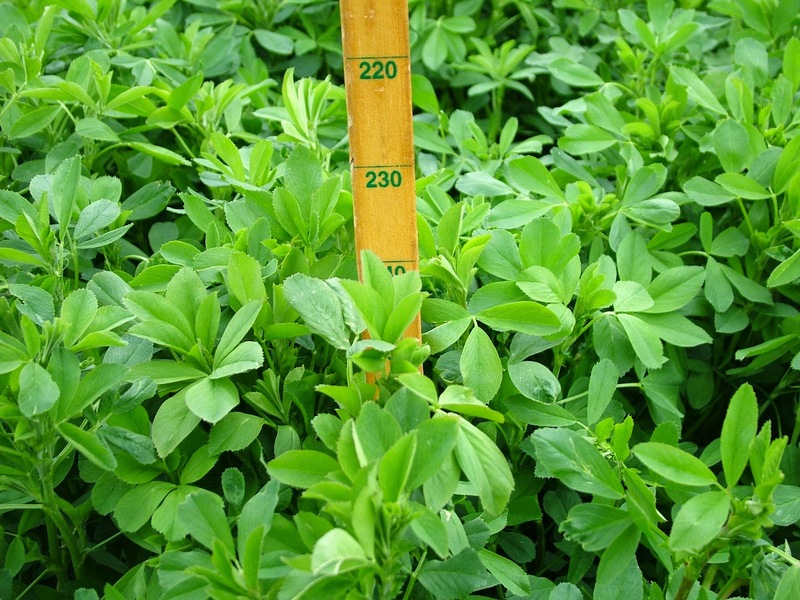 The average alfalfa plant has roots 10 to 20 feet long or more. Getting alfalfa into one's diet is not at all complicated. It can be taken in many different forms. A popular way to get this herb into the system would be to drink brewed tea daily. For added benefits and a better taste, a helpful suggestion would be to brew alfalfa tea with another flavored tea, as while the health benefits of this herb are extremely apparent, the taste can be slightly bland. This herb can also be taken in capsule form, in much the same way a person might consume their daily mutli vitamin. This is a great way of gaining all the health benefits every day. 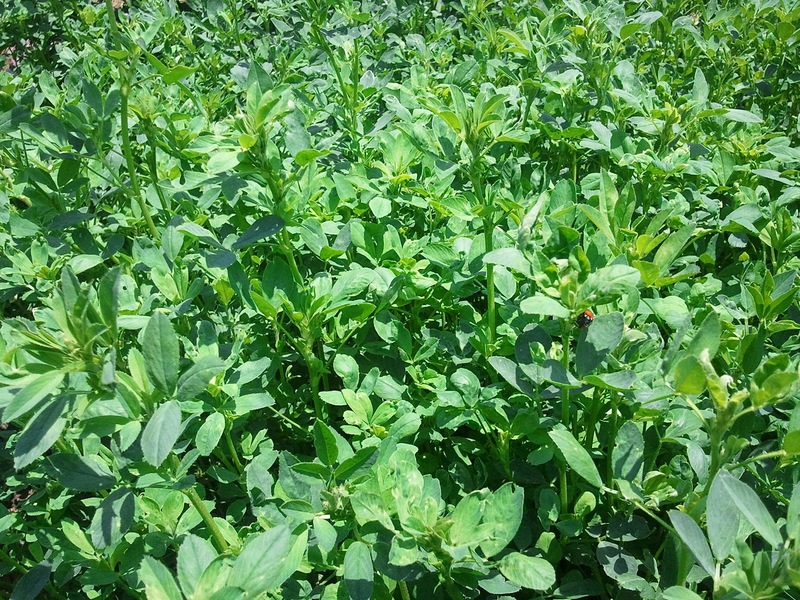 Dried Alfalfa is as good, if not better, than fresh Alfalfa so capsules are a great way to take it. Alfalfa can also be mixed in with different foods. Salads, soups, casseroles, or whatever one's heart desires can be made astronomically more healthy without hardly any change in taste. The alfalfa herb is very mild in flavor and because of this, it can be used in many different ways.